Giving a hand-carved Christmas ornament or gift is as much fun as it is to make one. 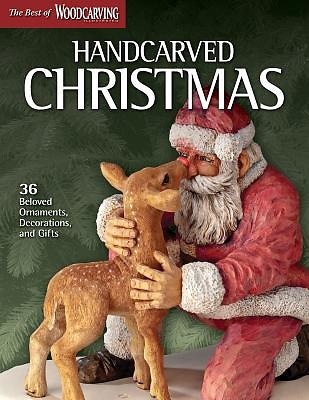 This compilation of favorite Christmas carving projects from the archives of Woodcarving Illustrated includes projects and patterns for delightful carvings made from clothespins, caricature ornaments, a Christmas stocking, whittled pencils that make great gifts, a folk art tree topper, an evergreen tree with painting instructions, lovely earrings and much more. And of course, there are many Santa projects as well. Handcarved Christmas's projects and patterns are from some of carving's leading experts including Shawn Cipa, Floyd Rhadigan, Chris Pye, Don Dearolf, Rick Jensen, Robert Biermann, and Sandy Smith. There's a project inside this Best of Woodcarving Illustrated collection for everyone, from beginners to advanced craftsmen. With step-by-step instructions and color photos, readers are guaranteed a very merry carving experience.